"I serve this at least once a week with a chicken or steak meal or just as a quick snack. Learned from my late grandfather who was of Lebanese descent. Serve with fresh Arabic bread." Discover a simple family recipe for authentic Syrian hummus. For thinner hummus, add more a little more water or even the liquid from the chickpeas. I find 1/4 cup water with totally drained garbanzos is perfect; after refrigeration it will thicken up. 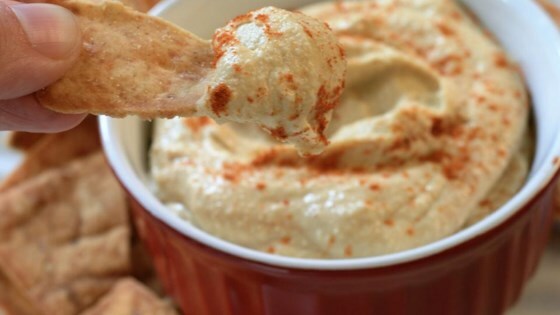 This is the basic hummus recipe and is simple yet delicious. Enjoy! A simple recipe to follow that yields great results. From now on, I'm making my own hummus instead of buying it and spending more $$. Thanks for the recipe! My husband is a hummus fanatic. He claims this is the best yet. I upped the lemon juice to 3 tbs and added 8 oz of drained roasted red peppers. Super-easy, super-tasty. Had these down by the pool with pita chips. Great snack. Great recipe! I read the coments and aded an extra tablespon of olive oil, 1/2 tsp salt plus 1/2 tsp of cayenne...Perfect! I wil never purchase Hummus again!